Awe thanks Cathy! You rock I'm working my through the process. Thanks Sandra! And thanks for checking out Wild Whisper and their Blog Hop. I love the amazing detail and layers on this. I am so excited to try this product from this amazing new local,company! Wow! I agree with the other commenters! What amazing detail! And I LOVE the bears too :). The bears are awesome. I love images with in. It really does look like dirt. Thanks. It's fun when it comes together. Fantastic card Kim! I love all the details you've added and the stamp is fantastic on the card. What an amazing card - love all the layers! Wow Kim this amazing. I absolutely love it! Wow! Love all the layers! Looks awesome Kim! I love those bears too, and thanks for the tip using the Glossy Accents and embossing powder! Thanks Karla. The pages just just inspire everyone. Enjoy the projects on the Hop. I'm amazed st how unique we all were. Oh my gosh that is amazingly detailed! Love it! And love bears too. Wow, what an awesome card! 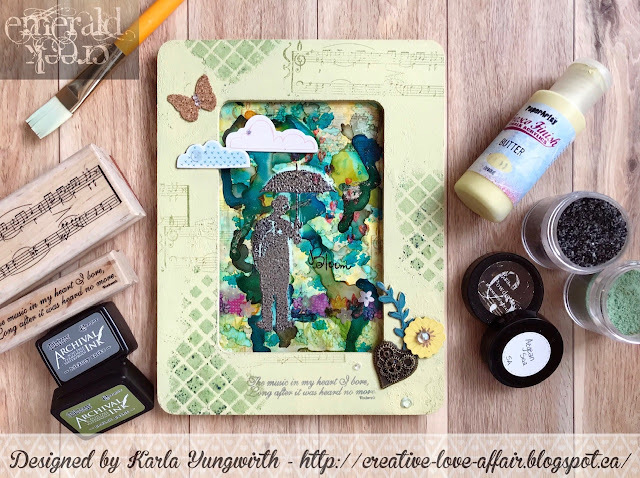 Thank you for sharing so many great tips: incorporating stamping to add perspective to the background, using glossy accents & embossing powder to create the "dirt", adding non-traditional scrapping items like the moss & stone chips - truly wonderful! I LOOOVE this collection! And I love the nature feel of this! WOW!! Thank you for showing me to think outside the box when using embossing powders!! Such a "cozy" collection!! Thanks for inspiring me Kim!!! Very fun! Wishing I were as confident in using some many materials. Stone chips! How creative! I love the 'dirt' too! Great project! Love the variety of elements you used! OBSESSED WITH THIIIISSSSSS - especially the branches!! Thanks so much. It's so weird how gold the charred gold becomes when heated. I was happy it looked. Kim, your Use of These products is just amazing! I love how you've combined your beautiful landscape stamps with the Wild Whisper papers and your tip for using the embossing powder and GA for dirt is genius! It looks like a stream bed to me...glittery like the sun is being magnified by the passing water. It's great to see Emerald Creek's pinecones paired with Tim's--it gives me perspective. Yours are my favorite charms, and I've been kind of hoarding them. This is truly a lovely work of art! Thank you for sharing! Hugs! Love your dimensional card with all the beautiful natural embellishments you added to it. The tree is really cool! This is absolutely wonderful Kim! I love your creative use of our products together, they coordinate wonderfully! Thank you so much for participating in the hop, we really appreciate it! Heather, thanks so much for the invite. This was truly amazing. Great use of product, it looks great! I, too, love the bears - gorgeous project! I am blown away by this card! Oh my goodness! It's beautiful, it reminds me of Alaska, where I live. It really give you a hint of both the holidays and wilderness. Wow Kim, you know I am a fan of your work! This is an amazing project...those layers and textures are to die for! I love the tip about the glossy accents and the embossing powder! TFS! Oh my woooooord woman!! You have managed to blow my mind again!! Thank you and I love the handle you go by Wendy! Wow awesome job. I never would have thought to use emboss powder in glossy accents- hum... and thise stones oh need some!